In a faraway house lived a girl called Star. 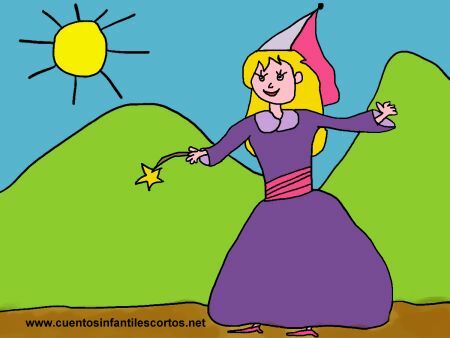 Her mum had called her Star because she said that some day would become a fairy: “When you are older, you will become a fairy, and will fulfill your wishes just by touching your forehead”, she had said. Star was a beautiful girl who had long, wavy reddish-brown hair. Her big green eyes illuminated her cute face, and her look transmitted kindness. Her stepmother detracted from her beauty. She was living with Star and forced her to do hard work inappropriate for her age, but Star used to do it so as not to be punished and shouted at by that old woman who never hesitated to mistreat her. Star used to dream about making real what her mother had told her. When she was alone in her bedroom she would touch her forehead and a little light would appear, and she then went to bed and dreamed of becoming a fairy soon. Her stepmother´s name was Ursula. She was a cold woman, full of resentment. She wore glasses, and had grey hair always gathered in a bun. She was very very ugly, and envied Star for being so pretty. One night, the little girl was sleeping deeply after working the whole day, when the awful woman approached her bed with a pair of scissors and cut her hair to shoulder length, then she put it inside a bag and burned it smiling with satisfaction. When Star woke up the next morning and touched her hair she broke down in tears. but when her tears ran down her face, a shining light lit up her room. It was her mum: “Don´t worry my little one, your powers will defeat this evil soon and your hair will grow fast”, she said and disappeared. Star felt better knowing that her mum was taking care of her and helping her. This gave her the strength to go on. Shev put a scarf on her head and began her household chores. Her eyes had no more tears left to cry and she felt pity for her stepmother. Once inside her room she felt an intense cold in her veins. She went to the bathroom and looked at herself in the mirror and realized that her face had changed. Her nose was longer and her hair was white and straggly. She screamed with horror: “I’m a witch, I’m a witch! Help me!” – and she ran and ran until she arrived to the garden where a big witches broom was floating in the air. Suddenly, the wind pushed her onto the broom and in seconds the evil Ursula flew away into the hills. The next morning, the sun announced that it was a beautiful day. When Star woke up could not believe what she saw! Her hair was long and beautiful and she had a star on her forehead. She looked outside the window and saw the garden was full of flowers. The birds were singing happily and a soft spring breeze caressed her face. But her surprise was even greater when she saw a boy with straight, blond hair, smiling at her as he walked along the path. The girl felt her heart was falling in love. A prince had arrived to live and share many happy days with her.